It’s going to be the Chinese Year of Pig! This year, the first day of the Chinese New Year falls on Tuesday, February 5. Traditionally, the Chinese New Year is celebrated over 15 days. The festivities begin on the eve of Chinese New Year, when families gather together for the annual reunion dinner. The next two days are typically spent visiting relatives and friends, a custom that can stretch to the fifteenth day. 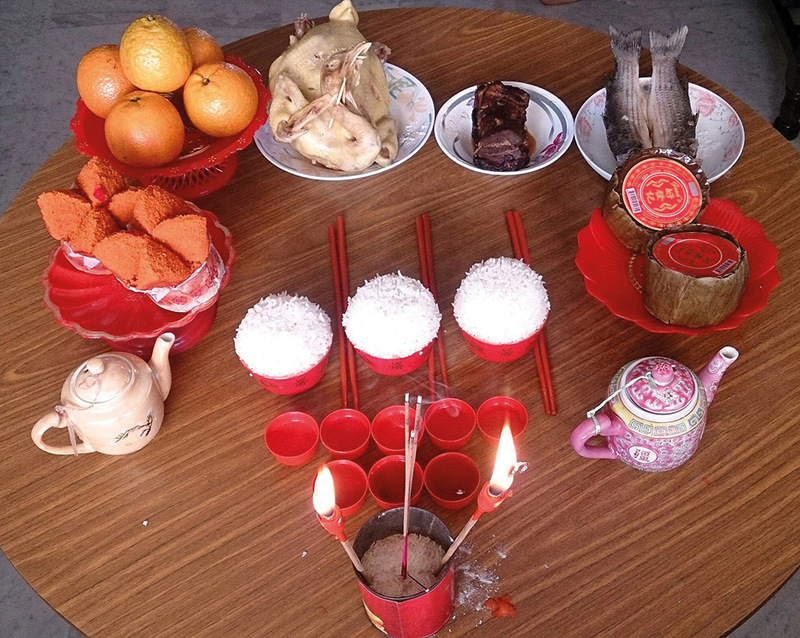 On the first day of the New Year, offerings are made to the deities to welcome them. Chinese New Year celebrations have become simpler in modern times. But traditionally, each day of the 15-day Chinese New Year has its own significance and customs! Do you know what each day represents? First day: The first day of the New Year is the time to welcome deities and visit the elders in the family to pay one’s respects to them. On this day, it is considered taboo to sweep the floor or empty the rubbish bins, because it represents sweeping away one’s luck and fortune. Second day: This is the day that families visit the mother’s side of the family. Known as huímén (回门), married daughters return home to visit their parents with their husband and children. The second day of the New Year is also considered the birthday of all dogs, when dogs should be given a treat! Third day: In contrast to the other days, no visiting is done on the third day as it is considered to be an inauspicious day. In addition, legend goes that rats are married on this day. When night falls, one must turn out the lights and go to bed early, so as not to disturb the rats during their wedding celebrations! 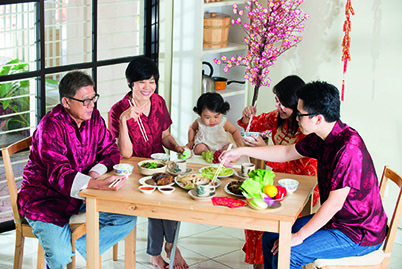 Traditionally, family reunion dinners take place on the first day of the Chinese New Year with the husband’s parents, and on the second day with the wife’s family. Fourth day: This is the day people welcome the Kitchen God back to the mortal world. The Kitchen God, who protects the family, is said to return to Heaven on the eve of Chinese New Year, where he delivers his report on the family to the Jade Emperor. When he returns to the household on the fourth day, it is customary to stay at home and welcome him with offerings of food and fruit. Fifth day: The fifth day is known as “Breaking the Fifth” (破五, pòwǔ), when the taboos of the previous four days can now be broken. This includes sweeping the floor and clearing the rubbish bins, which now represent removing poverty from the home (送穷出门, sòng qióng chūmén). The fifth day is also the God of Wealth’s birthday, so businesses will make offerings and pray to the gods of wealth and fortune. The fifth day also marks the day for businesses to resume after the holiday closure. Sixth day: Some businesses and restaurants will choose to officially resume operations on this day. It is also said that those who are 12 years old this year will be extremely popular, because 12 is a multiple of the number six. 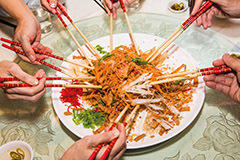 In Singapore and Malaysia, tossing and eating yusheng (Lo-Hei Yu Sheng 捞起鱼生) is a popular activity during Chinese New Year. Seventh day: Traditionally, this day is known as “Human Day” (人日, rén rì), the birthday of all common people. Bright and clear weather on this day signified peace and prosperity in the coming year, whereas cloudy and rainy weather marked a year of disease and epidemics ahead. Eighth day: This day is the birthday of millet, an important crop in ancient China. On this day, the Hokkien Chinese will also be busy preparing food and incense for the Jade Emperor’s birthday, which begins at midnight. Ninth day: The Jade Emperor’s birthday falls on this day. Starting from midnight of the eighth day, the Hokkien Chinese hold prayers and make offerings to the Jade Emperor. They also pray for good weather during the new year. Tenth day: This day is said to be the birthday of the God of Stone. As a result, it was considered taboo to move any stone. Eleventh day: On this day, fathers traditionally invite their son-in-laws to dinner. If there are any leftovers from the birthday celebration of the Jade Emperor, they are eaten on the tenth and eleventh day. Twelfth day: This day is known as guīníng rì (归宁日), when married daughters return home to visit their parents. Thirteenth day: After several days of rich food and meat, it is customary on this day to eat vegetarian food like porridge with mustard greens, to give the stomach and body a break. Fourteenth day: On this day, preparations are made to celebrate the last day of the Chinese New Year. Fifteenth day: The final day, known as the “First Night Festival” (元宵节, yuánxiāo jié) marks the first full moon of the New Year. Because lanterns are lighted and carried, it is also known as the Lantern Festival. 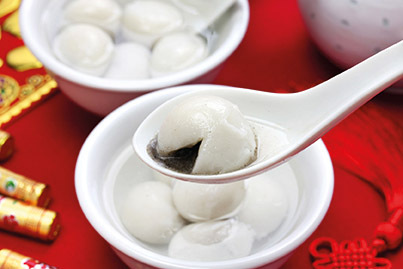 On this day, families gather and eat tangyuan (汤圆) – glutinous rice balls in sweet soup – which symbolise reunion. On the last day, families gather and eat tangyuan- glutinous rice balls in sweet soup – which symbolise reunion. In Singapore, it is customary to exchange mandarin oranges when visiting relatives and friends during the Lunar New Year. Two mandarin oranges, which represent good luck, are placed in a decorated bag and presented to the host. The host returns the favour by presenting two oranges to the visitor. According to Chinese custom, married daughters should visit their parents only on the second day of the Chinese New Year. But most Singaporean Chinese do not adhere strictly to the custom, and may visit the maternal side of the family on the first day as well. New Year visiting in Singapore is less of a hassle, given the small size of our country. But for larger countries like China and South Korea, the yearly migration back to one’s hometown for New Year reunions can be quite a nightmare. South Koreans also celebrate the Lunar New Year, which is known as Seollal. Seollal is the longest holiday in South Korea, and South Koreans around the country commute back to their hometowns to visit their loved ones. According to the Korea Expressway Corporation (KEC), in 2017, over 200,000 vehicles had already travelled out of Seoul the day before the official start of Seolla. During the three-day Seollal, the family performs a ritual called charye to express respect and gratitude to one’s ancestors. This is followed by a big feast. After the meal, the younger generations pay their respects to the elders by performing a deep bow called sebae and giving them gifts. In turn, the elders offer their blessings for the year. The children also receive sebaetdon (similar to red packets) as a gift. The rest of the day is spent eating and playing games. In Vietnam, the Vietnamese celebrate the Lunar New Year as Tet Nguyen Dan, or Tet for short. Like the Chinese, the Vietnamese prepare in advance for the New Year by cleaning and decorating the house. On the first day of the New Year, gifts are exchanged among family, relatives, and friends. The children receive lucky money in red envelopes. Although the Chinese New Year is not an official holiday in the United States, many American Chinese take time off to celebrate and visit friends and family. Cities with large Chinese communities like New York City and San Francisco, also host large celebrations with parades and events like dragon boat racing and lion dancing.